Tickets are $10 We are proud to announce that we will be hosting our 3rd quarterly Gathering! The Gathering: Open Mic With A Cause is more than just an open mic; it’s a movement! This April we have the wonderful opportunity to partner with Safe Shores, DC’s Children’s Advocacy Center. They are celebrating 20 years of service and Kiane Ink is celebrating with them! Come join us Saturday April 18th at 6:30 pm as we not only hear and witness great talent, but learn how you can join the fight against child abuse. Thinking about signing up for the open mic? Click Here to find out more! Contact us to find out how KIANE INK can help raise awareness about your charity or to find out about our next event. Lady Di your support and presence at our events is always an honor! 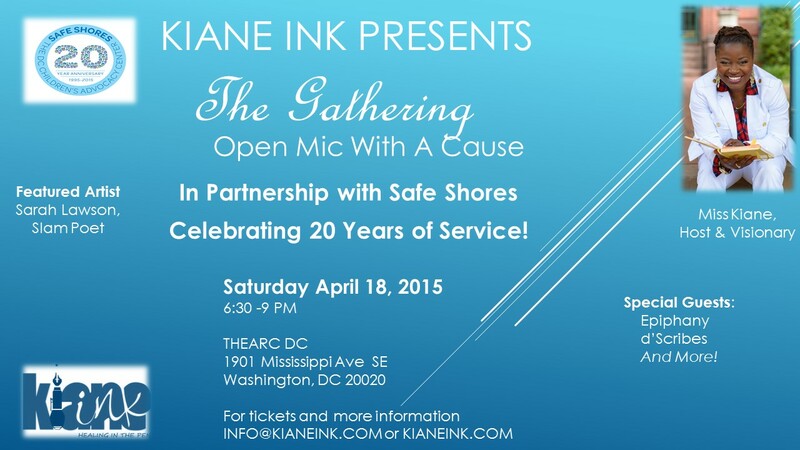 We are planning a closed mic event in April and Kiane Ink would love to have you on the roster!